First, let's talk about that central seating position. Resurrecting a dormant childhood dream, I spent almost nine months of this year as an over-the-road truck driver – six months in a Freightliner Cascadia pulling a refrigerated trailer, then nearly three months in a Kenworth T680 pulling a flatbed. I drove more than 90,000 miles, from New England to the Pacific Northwest, from San Diego to central Florida. I retired this month, partly because the dream has dark sides so dark they'd shame a black hole. Last week I watched Elon Musk unveil the Tesla Semi to see how he'd address some of those unsavory elements. We don't know what the production truck will achieve when it hits the road, but the Semi has a lot going for it. Nevertheless, the Semi seems most impressive to those who don't know what it's like to be a truck driver. First, let's clear up what this truck is for, as it was presented. This is not an over-the-road truck. This truck suits line-haul – routes that run between a company's terminals, like from one regional Wal-Mart distribution center to another. When Musk made the case for a 20-percent savings over a diesel truck, he based the numbers on a 100-mile trip – fifty miles out, fifty miles back. The Semi would be perfect for port work, which involves lots of waiting, idling, stop-and-go traffic, and local out-and-back trips. This first version of the Semi will not replace the dozens of thousands of trucks on huge regional or coast-to-coast runs, clocking 2,000 to 5,000 miles per week. I only have space here to address a few issues, so we'll start with the central seating position. I don't see how that helps a trucker. I already get "a commanding view of the road" in a traditional truck because I sit six feet above traffic. What I need is a commanding view of my own truck, which the central seating position compromises. The worst blind spot in a tractor is next to the doors; in the Tesla Semi, I can't lean over to see if there's a Toyota Corolla camped out beside me. The central seating position hampers my commanding view when I need that view most: when I back up. For any backing maneuver, I watch both sides of the trailer in my mirrors to make sure I don't clobber anything, or I lean out of the truck to watch the trailer as I back. Being able to physically watch the trailer – not camera images on screens – can be the difference between making a clean back-up or making an insurance claim. Furthermore, I can't see around trucks in front of me without pulling halfway into another lane. When I need to exchange paperwork with the guard at a terminal, or the police, I can't lean out the window to do so. Speaking of which, I have to believe one of the windows on the Tesla Semi rolls down, but I can't figure out which one. If, as it appears from the renderings, the windows only vent, well... that's unacceptable. I'd want more mirrors. The silver, condo-sleeper truck at the presentation only had cameras mounted at the rear of the tractor. The black, mid-roof truck supplemented physical mirrors on lengthy stalks on both sides of the cab. Most new trucks come with mirrors mounted on the front fenders that provide views of the front corners – my Kenworth had seven mirrors in total, I've seen plenty of trucks with more. You'd be amazed at the number of tiny concrete and reinforced steel impediments lurking at truck stops and customer terminals. 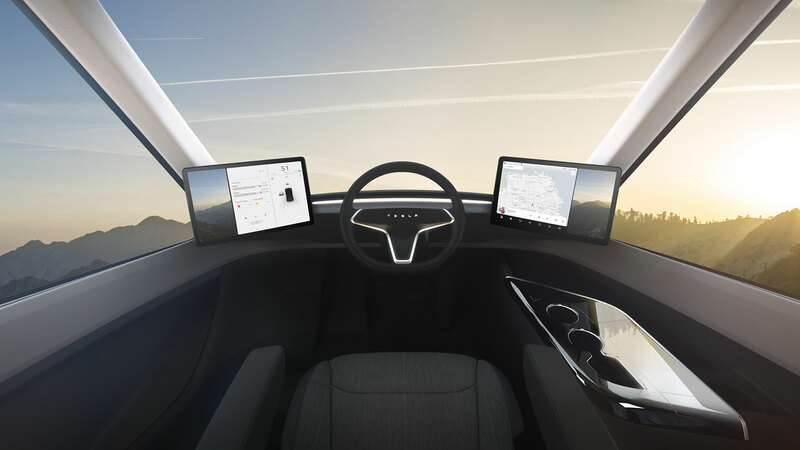 I know such mirrors would hamper aerodynamics on the Tesla Semi, but when those $8 contraptions could save thousands on carbon fiber repairs and downtime, I don't see why anyone would go without them. Another reason to have physical mirrors: so I can turn off, or turn down, the two giant screens in the cab (screens which, by the way, hinder my view of the corners of my truck). The light required to provide a useful camera image at night would kill my eyes during a full drive shift. Doing an 11-hour stint in a dark cockpit in the glow of large digital screens only works in anime and "Battlestar Galactica." I had one computer in both trucks I drove, and unless I was using it, I turned the screen off. "We want a vehicle that accelerates like nothing else." I understand acceleration is a core Tesla brand value, but I'm far more interested in braking. An 80,000-pound tractor trailer needs about 550 feet to come to a complete stop from 55 miles per hour, and I spent a surprising portion of every driving shift trying not to obliterate car drivers who weren't aware of that fact. Show me how much the Semi can lop off that braking distance. "[A truck cab is] a clutter of third-party devices, it's very difficult to use.... It's a pain-in-the-neck." No, it's not. The trucks I drove had one necessary third-party device in the cab, a Qualcomm computer to communicate with HQ, and I put a portable GPS unit on the windshield. That was it. The truck cabin photo Musk used during the presentation had a Qualcomm-type unit, plus a traditional GPS, plus an iPad with a GPS display, plus another small display I couldn't identify. I've been in plenty of truck stops and walked by a ton of trucks, and only the most frightened novice or the most chronically indecisive driver would mount that much junk. "You have to sit there for 15 minutes while the tank gets filled." Truckers don't "sit there" while filling up at a truck stop. Truckers clean all the windows, mirrors, and headlights, check the tires and axle seals, make sure every tractor and trailer light works, and look for damage. This walkaround can take longer than the actual fill-up, and it must be done no matter what energy powers the truck. This is a lie, unless the Tesla Semi and Tesla trailer can counteract physics and human error. My Freightliner weighed about 18,000 pounds, the reefer trailer added about another 16,000 pounds. That left enough for about a 46,000-pound load. When stuffed to the gills, I had 62,000 pounds ready to push me around or come around. If, either through physics or human error, the drive wheels or the trailer break loose too far, the Tesla Semi won't stop the jackknife. These are only a few questions I have about the driver experience, before we get to some of the larger trucking issues the Tesla Semi wants to address, but it's enough for now. 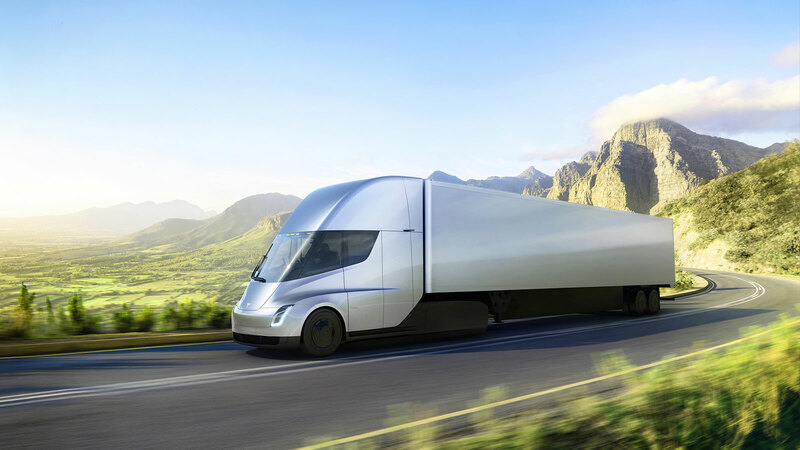 Electric trucks, including the Tesla Semi, are inevitable and welcome; making trucking more efficient and safer for drivers, fleet operators, and the environment benefits the entire world. Companies like Wal-Mart and JB Hunt that have placed orders for Tesla Semis have the routes, terminal control, and money for terminal infrastructure to make the most of the Semi, so we'll see what the production unit looks like in 2019 (hopefully) and parse the feedback after 10,000 miles of road duty. Don't be surprised to see more mirrors. This article originally appeared on Autoblog, the complete authority for news, reviews and car-buying research.